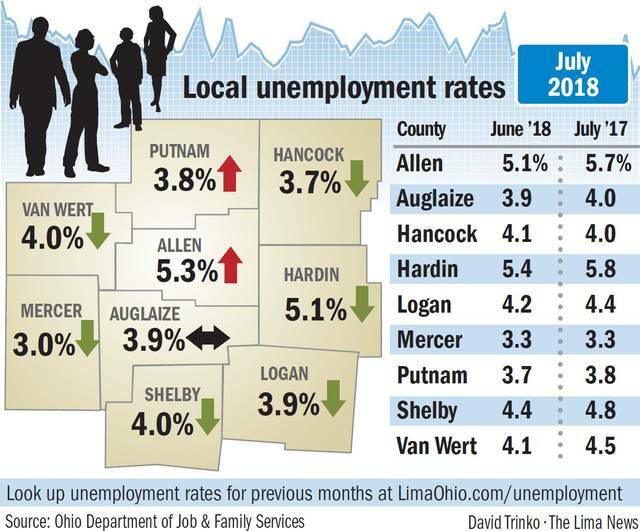 LIMA — Two out of the nine regional county’s unemployment rates have decreased from June to July, according to figures released Tuesday by the Ohio Department of Job and Family Services. Three out of the nine counties in this region were among the 10 best unemployment rates in the state, led by Mercer County (first, 3.0 percent), Hancock County (sixth, 3.7 percent) and Putnam County (seventh, 3.9 percent). Although not all the counties made the top 10 unemployment list, seven out of nine counties were lower than Ohio’s 5.3 percent unemployment rate. The unemployment rate in Allen County increased from 5.1 percent in June to 5.7 percent in July. There were 100 fewer people employed in July than in June, along with 100 more people unemployed over that same period. Even with those changes, the labor force has remained steady at 49,500. Despite a total of 2,500 unemployed, there were 1,557 jobs available within 10 miles of Lima on Tuesday afternoon, according to OhioMeansJobs.com. Of those 1,557 jobs, 1,462 were full-time opportunities, with 31 percent of them middle-income jobs with annual salaries between $30,000 and $49,000. Putnam County’s unemployment rate rose from 3.7 percent in June to 3.8 percent in July. This rate was the seventh best rate in Ohio behind Hancock at 3.7 percent. There were 300 fewer people employed in July than in June and and the number unemployed remained at 700. The labor force decreased by 200 from 19,100 in June to 18,900 in July. Auglaize County’s unemployment rate in June was 3.9 percent, which is 0.1 percent less than in July. There were 200 fewer people employed in July than in June, while the number of people unemployed remained at 1,000. The labor force to decreased by 200 people from 25,400 in June to 25,200 in July.